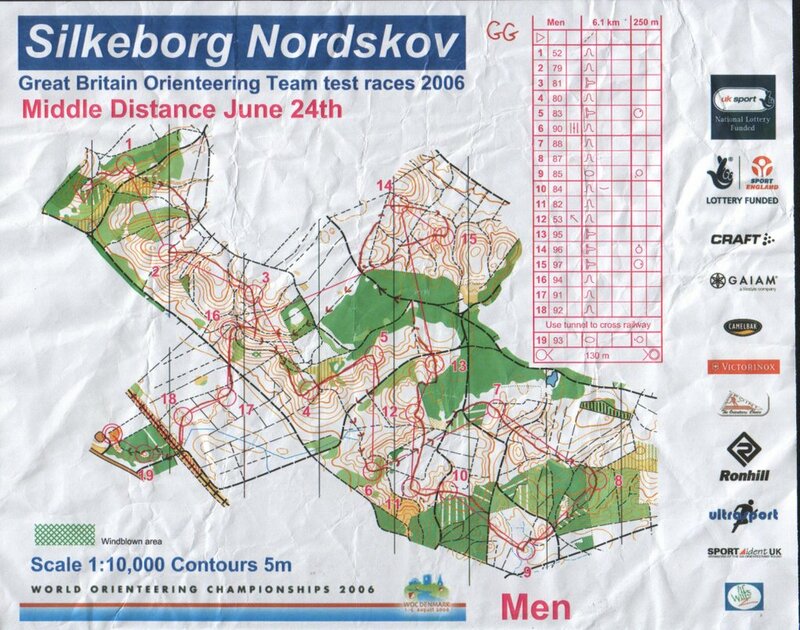 Well I have been selected for the British WOC Team for the 3rd year in a row, and I am running just one discipline for the 3rd year in a row. Can't say I am particularly happy right now. After the great spring I have had I was confident of getting 2 disciplines before the weekend. Obviously the selectors can't make everyone happy but that doesn't really make it easier to accept. The middle race was the one I wanted and I have come away with just the sprint. Well done to everyone who made the team though. RESERVES Jo Stevenson – Reserve for the Long only. All other disciplines maybe replaced by an existing team member. Ewan McCarthy – Reserve for the Sprint only. All other disciplines maybe replaced by an existing team member. 8th place, 8 minutes down on Jamie and perhaps I shouldn't have run today. Felt ok this morning after spending most of yesterday afternoon in bed, but after about 2 or 3km I knew I was still not right. Struggled round though, not making many mistakes (lost maybe 2 - 3 mins) but very aware that I wasn't running as fast as I would like. All can do now is just wait for a phonecall to find out my fate. 5th place in todays middle race. Woke up with a slight cold, but felt ok to run. Had a decent run, one small route choice error and wobble cost me about 20-25 seconds, and I got stuck in some green for about 10-15 seconds, but apart from that had a clean run. May not have picked quite the best route on the long route choice leg but I felt I had done enough. I was about 45 seconds down at the end in 5th place and a little bit disappointed. Maybe my cold was slightly worse than I thought and I felt worse at the finish. Will see how I feel in the morning before I decide if I will run the long selection race. First place today in the GB sprint selection race, so it looks like I'm off to Denmark. Middle race tomorrow and classic on Sunday. 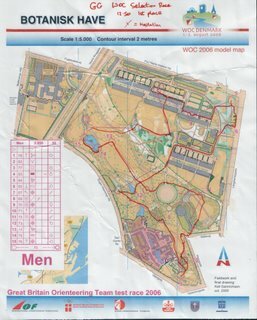 The race was at Botanisk Have in Aarhus, the model event for WOC sprint, lightning fast open parkland with many single trees and bushes and some small areas of woodland, some of gardens and some urban areas too. I had a good race and never lost more than a couple of seconds on any leg. 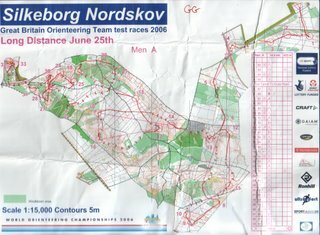 The course was technically very easy and there wasn't a huge amount of route choice. Will put my map online early next week when I get home. 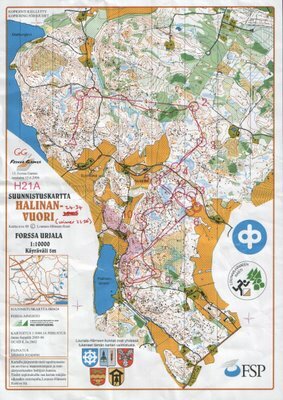 I travelled out on Tuesday to the region south of Paimio in southern Finland for a few days training and racing before this years Jukola. Staying with my club Tyrving, we were based in a beautiful wooden cabin close to the seafront. 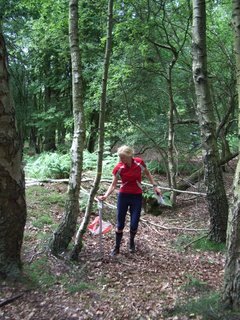 Plenty of messing around, some rowing, some fishing, even a little bit of orienteering. 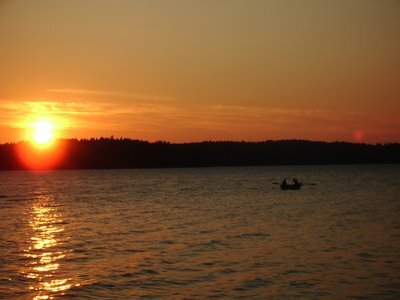 Thursday evening was the Forssa Games which is quite a prestigious race close to the town of Forssa north of Helsinki. Possibly the biggest mid week evening race I have ever been to, definitely with the best field. The concept is simple. 180 men and 120ish women run elite, which is a short race with a winning time 20-25 mins. I had a pretty good run, despite having almost the last start at about 8.30 in the evening, and finished equal 14th 1min40 down on the winner Tero Fohr. I started very quickly and ran strongly to number 1. I came out of the control slightly wrong though and took a really bad line to number 2, losing about a minute to the leaders. I recovered well though and was getting good splits all the way round. 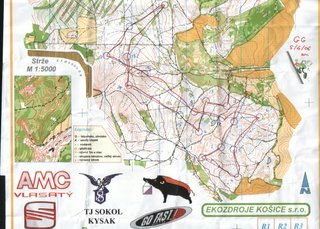 The only other controls that I lost time on were 7 and 10, the two legs where perhaps I should have avoided the brashings and the marshy area and sought out more runnable forrest. A very good performance for me, getting good splits and beating some top names. After a few weeks of illness and family things it was a good feeling to have a good race in such a top competition. The biggest competition in the world. 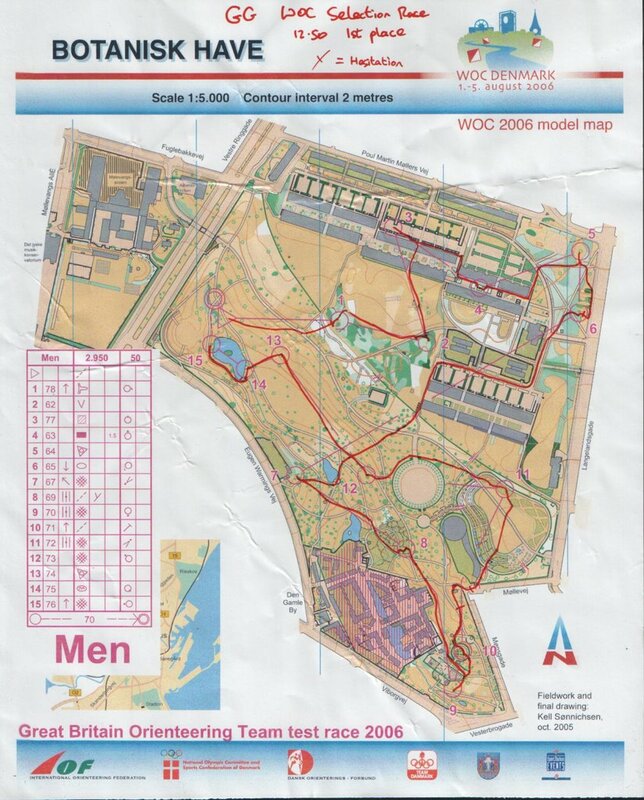 Mens relay run at night with 1300 teams (7 per team) and womens relay with 800 teams (of 4). 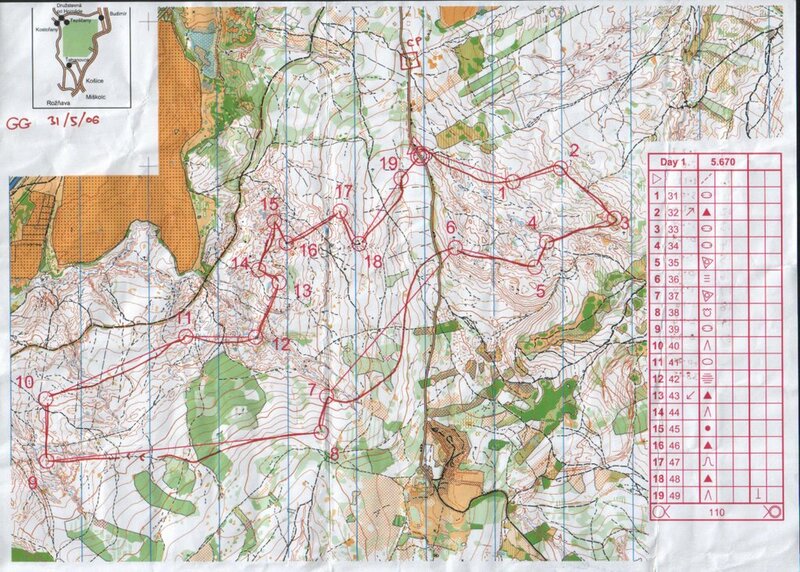 I ran last leg for Tyrving (our top runner Audun had to drop down to a shorter leg ... again), and found it very tough. 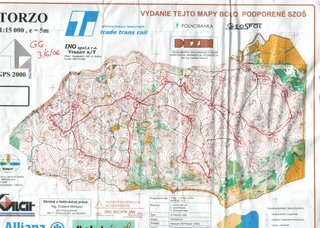 14km with 700m climb and endless climbs, crags, marshes, brashings, not to mention pretty tricky orienteering in places. I had a reasonable run, nowhere near my best, but good enough to only lose 1 place to some of the top runners in the world to leave us in 39th place. My best finish in 3 Jukolas, but with the team we have, we know it could be so much better. I made 2 pretty big mistakes (3 and 4 mins) and a couple of smaller wobbles, and ended up with the 64th best time for the leg, which is not great but then again not bad out of 1300ish. 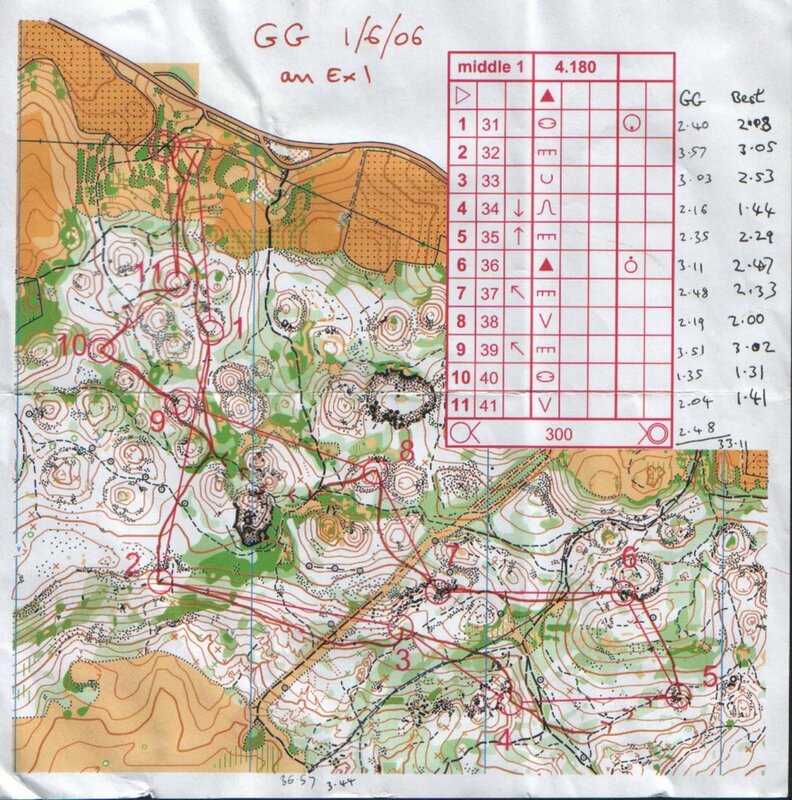 My race was split into 3 parts really, the first 9 controls I ran alone, doing pretty well with some hesitation at 5 (number 31) and a big mistake at 9 (number 60) which was a result of leaving the previous control in the wrong direction and failing to pick up that error. Jamie Stevenson caught me on the long track run to number 10 (130), and while taking some different routes, we stayed together almost until the end (although he got away from me over the last km or so). We were doing really well until the tricky green area with lots of controls. To start with the route out of the previous control was bad, Jamie went a different way, and we had different gaffles anyway. I rushed in without a plan and proceeded to lose about 4 mins in the green finding loads of controls but not mine. Eventually relocated looking down at the road. After that, Jamie caught me again on the way to number 97, along with Andrej Khramov and Mats Troeng. Staying with them was a challenge and after about 2km I couldn't any more and dropped off the back on the way to number 147. The second last control, 129, proved to be possibly the trickiest control of the day, and I almost caught them again. I saw them running out of the control as I was getting close, but I missed it slightly too and ran into the finish alone. 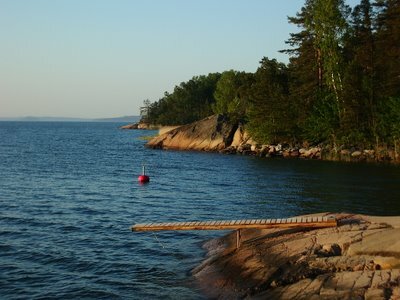 A pretty good run, but still things to learn from it including 14km in Finland in that terrain is TOUGH. 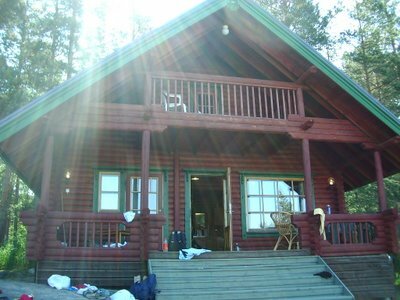 I'll be back next year though, 400km north in Lapua. Today I took part in a local race at Blackwood. I love living and training in the South East of England, but at this time of year the forests take on an entirely new appearance. Just towards the end of spring, suddenly huge fields of stinging nettles and other undergrowth spring up making many forests and parks unusable (not just in the south east, but all over England). 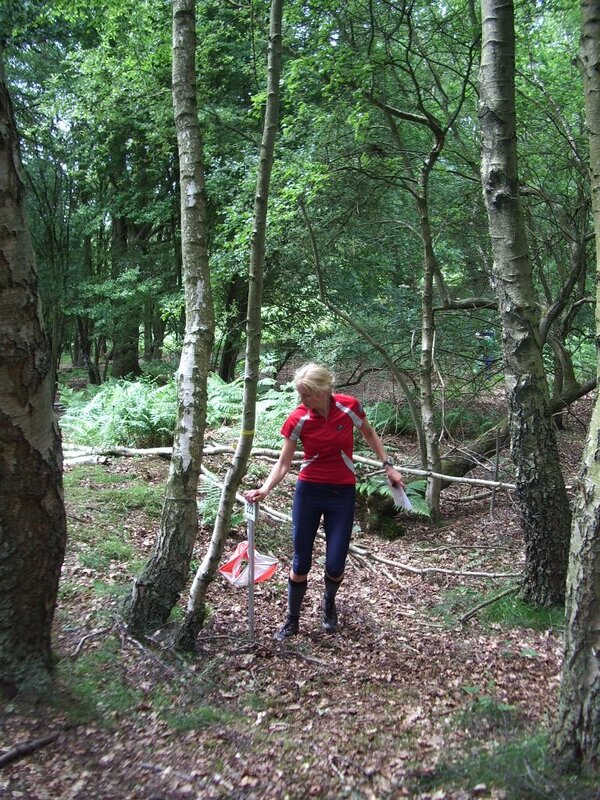 Then it becomes more difficult to train and you have to pick the training area carefully. 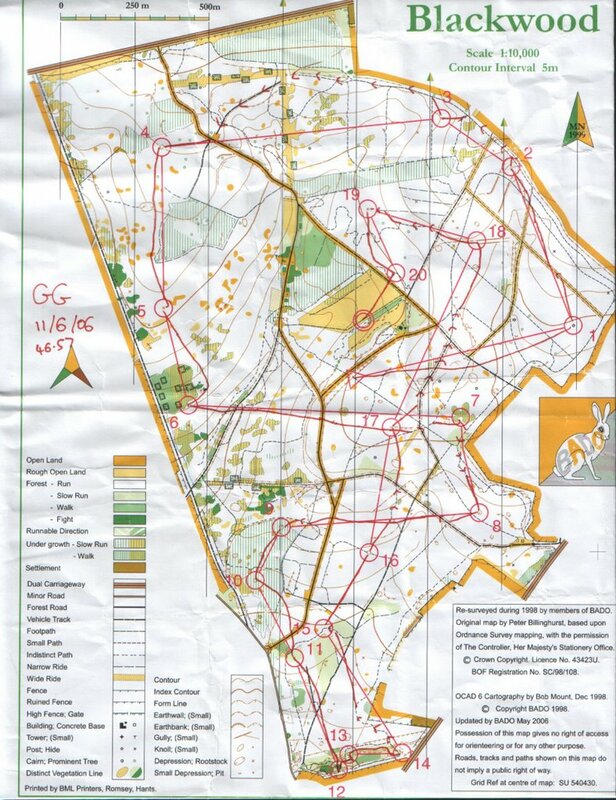 Blackwood was mostly very nice, and I am sure the courses were planned to avoid the worst of the nettles, but I still managed to run through quite a lot of them, especially at the sides of the big open tracks. It is not always such a problem in an important race as thoughts of stings are superceded by the competitive spirit, but in a training competition I find that the desire to avoid the worst of the nettles and the after effects is more noticeable. On several occasions I took quite long deviations or just slowed to avoid patches, but in general the forest was beautiful with good running conditions. My aim was to try and push the pace but stay in complete control, run confidently on my compass and minimise any time loss. The forest was clean on the floor mostly, with some areas of brashings and some with short grass which concealed branches and holes. Gently undulating, the terrain reminded me both of some areas of Denmark, and also the less technical parts of the middle areas for the World University Champs in Slovakia. 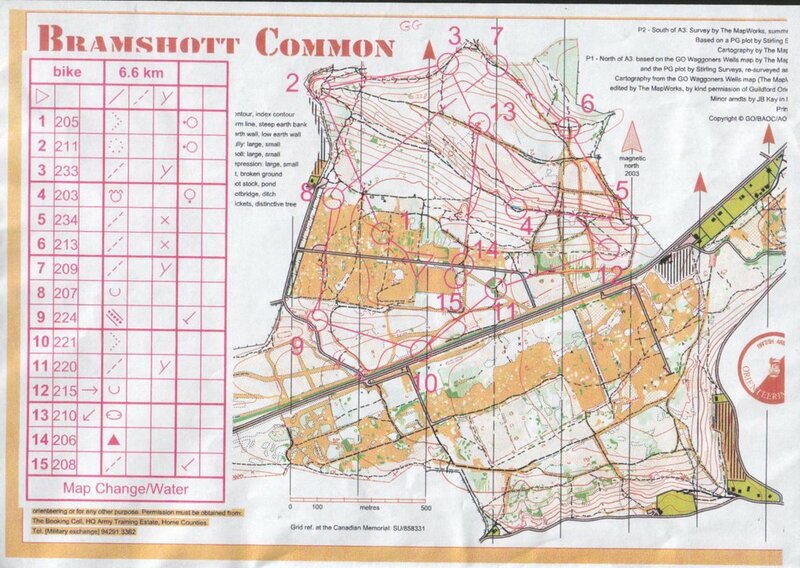 In general my aim was to run straight on my compass, and only take wider lines if the leg really demanded it. Along the leg I planned to pick up as much information as possible, and use it to gauge my direction and distance. 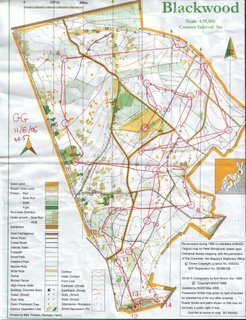 With such a runnable forest, there was no benefit to track running, and the only reasons for deviation from the line were to avoid height loss / gain (as leg 4) or to avoid areas of thick vegetation (as legs 6 and 10). Important skills were making sure that direction out of the controls was good, and judging distance without many features on the ground. Control 1 I was slightly concerned about as I didn't really see an obvious attack point, and no catching features. Having said that I knew that the forest had high visibility so I knew that I would be able to see the control from maybe 50-100m away. I knew that I crossed the path just before the control close to the junction, and so there was nothing to worry about. Controls 2 and 3 were straightforward using the shape of the ground as the main aid to navigation. Control 4 I decided to take the track route for several reasons - looking at the contours I didn't want to take any more climb than necessary (even though the slope was relatively gentle), although the forest looked really runnable out of 3, I knew that anywhere yellow was likely to be thicker and more overgrown, and most importantly the track route was simple to execute, gave me a good attack point to find the control and an opportunity to look ahead at the rest of the course. Control 5 was my first small mistake, slightly right of the line out of the control, I corrected myself at the large depression. Just coming down the spur I failed to read the open areas correctly and slightly misjudged the distance. But I kept my eyes open and looked all around, and I saw the control about 30m to my right. 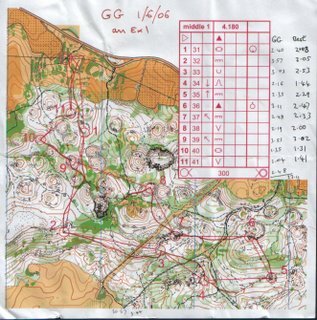 Control 6 - there was a lot more vegetation than is shown on the map, and my route was optimal. Control 7 was good, my direction was good and I picked up everything. Control 8 - no problems other than everything looks the same in this forest so I don't see the depression until I am about 5m away. Control 9 was fine except the block of forest half way should maybe have been light green. Control 10 - was slightly worried so took fairly slowly. 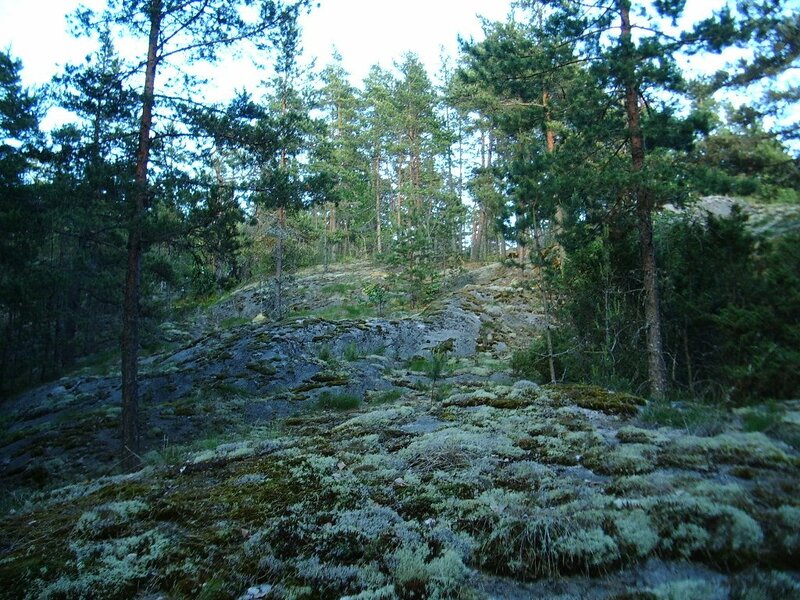 Thick vegetation and difficult to keep direction. Saw depression half way. 11 - I came out of control 10 the only way that looked nice and then corrected once in the white forest. Easy control though. 12 - Tricky control. Didn't see the big path out of 11, was overgrown. Wasn't entirely sure where I was approaching the control, but my line was good and I saw the flag from a way away. 13 and 14 I took slowly through the thicker vegetation. 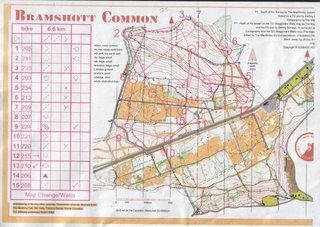 The paths didn't quite make sense, but my distance judgement was good and I used the contours. 15 to finish - back to running straight on the red line. Direction was perfect for 16. Decided to path it to 17 and most of way to 18. 19 was not very visible but again my line was good. Direction to 20 was poor as I was rushing at the end of the course. Control was not very visible even in the open forest. In general my race was very good. Very little time loss due to errors. Maybe a minute or two slower than it might have been in winter, and my legs were very tired and heavy after a 2hr+ session yesterday. It was also very hot, at least 30 degrees, so my heart rate got higher than I would expect in a training race. Unfortunately I have had to change my plan for this part of the season. 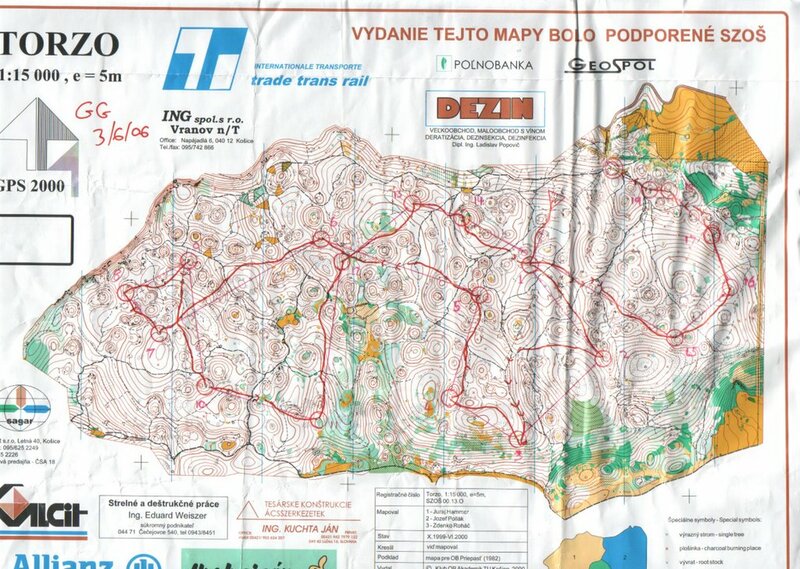 I had been planning on travelling out to Finland yesterday to take part in the Suunto Games with my club, IL Tyrving, and then spend the week training in relevant terrain for Jukola next weekend. This changed with the death of my aunt last week after a long struggle with cancer. Her funeral is on monday so I have decided to stay and train in England this weekend, and travel out to Finland on Tuesday in time to take part in the Forssa Games on Thursday. 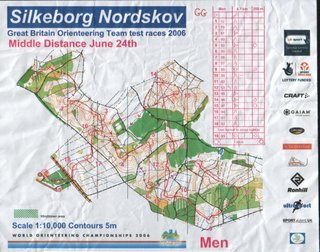 This will leave me a couple of days to train for Jukola, and then after that it is back home for a few days before travelling out to Denmark for the WOC selections. My goal is to be selected for two disciplines, probably sprint and middle. I think that it is unlikely that I will make the relay team but I am confident of making the team. I will end the month just relaxing at home, doing some training and watching the world cup.